Last year I was approached by a new client: The Church of Christ of Latter-Day Saints. They asked me to create an illustration for their magazine New Era. 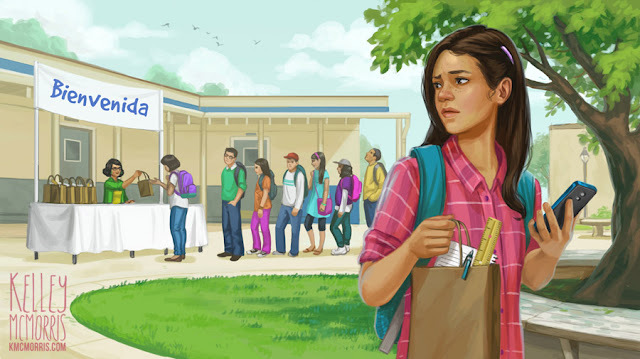 The story was called "Honest in All Things," and it was about a girl who was considering taking more than one bag of free school supplies. No big deal, right? No one would know. 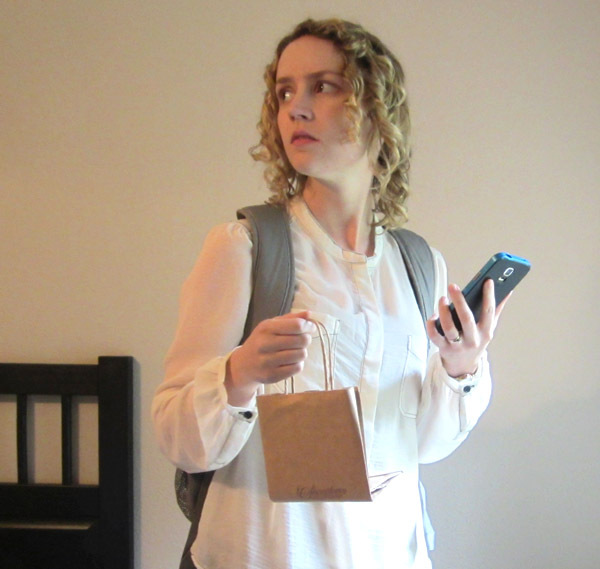 But then she found someone's smart phone in the restroom, and realized that taking an extra bag of school supplies was stealing, just like taking the smart phone would be stealing. 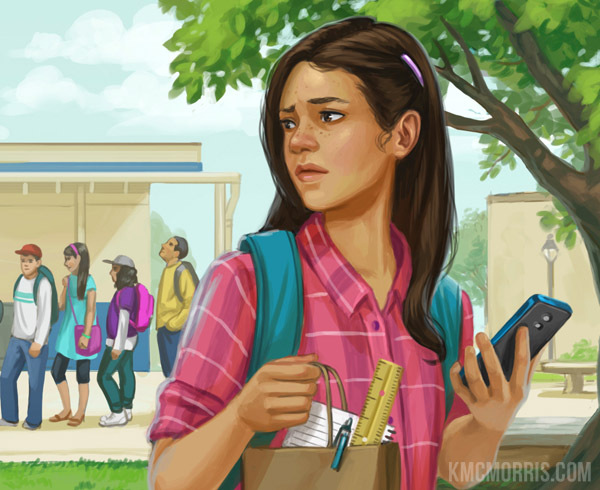 The client asked me to depict the girl, holding the smart phone and a bag of school supplies on her school campus. They also asked to see the line where school supplies were being given out to kids. Luckily this was an easy pose to take reference for. I grabbed a backpack, paper bag and my smartphone and voila. "Nope! Go to final!" They said. I stared dumbfounded at my computer screen. No revisions? None at all? They're not going to ask me to put a sweater on one of the kids in the back, or rearrange the formation of birds in the sky, or anything? I don't understand. *lapses into Shatner impression* I..........don't understand. 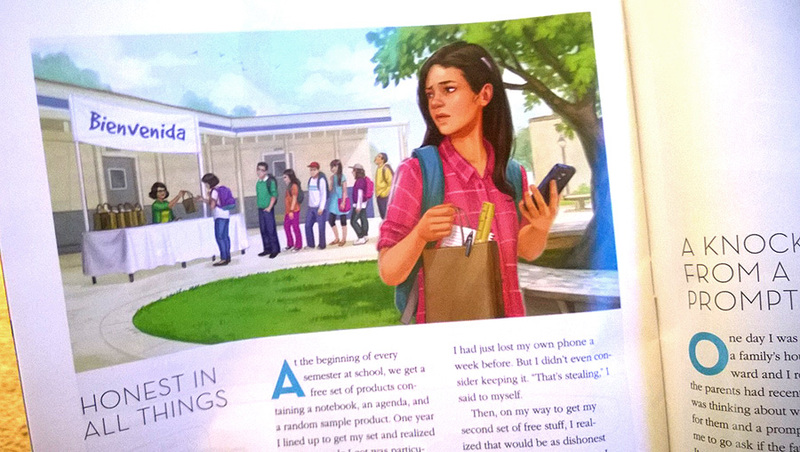 The illustration was in the April 2016 edition of New Era. I tried to get a copy, even went down to the local Mormon church, but I couldn't find one. I had to ask around to friends, and finally Miranda found a copy and took a photo for me. Thanks! 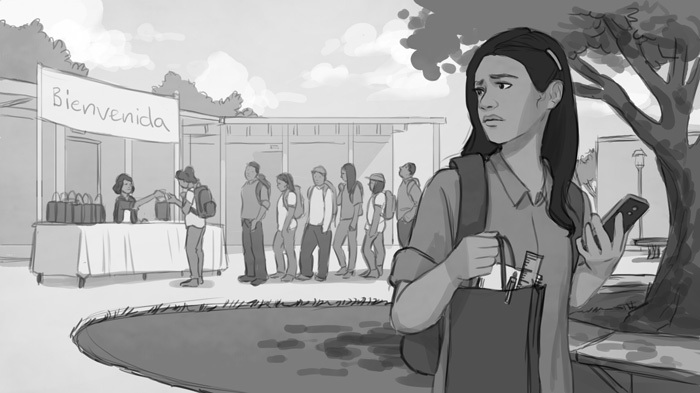 If you'd like to read the story, you can read it online. WHOA I've had one client like that ever, and I still don't believe that it was real. Must've been a fever dream.